Today, I am delighted to be Guest Designing at A Random Fan. I'm a big fan of Sherry's fab images. This is Little Miss Bashful, isn't she cute with her chunky boots?! Thanks so much for having me, Sherry. This looks great, Faye! So sweet and romantic and fab detailing! Gorgeous card Faye...and your coloring is great als always! Fabulous work as always Faye and great image. Oh magnific card. Combo & colouring are perfect! A gorgeous card Faye. The image looks fab and so beautifully coloured. 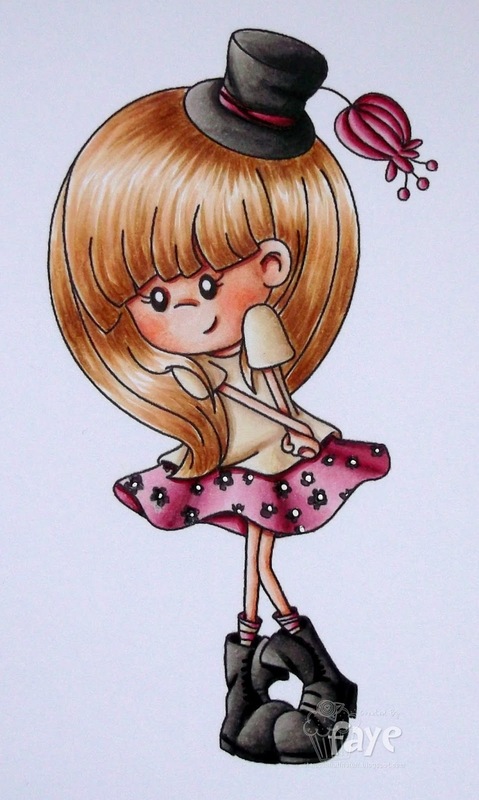 Such a cute and fun image brought to life by your wonderful colouring. I love your fabulous detailing too. oooh Faye.... you've outdone yourself here..... what stunning colouring... particularly of her gorgeous hair! LOVE your card... fabbie elements coming together so perfectly! You're surely an asset to the DT at A Random Fan! aaaaaw...this is so sweet!! Love how you colored her and the soft brown/kraft and pink color combo!!! Fantastic card!! She looks even better in the flesh so to speak. This is a cute image and hope to see some more of her hugs Muver. Stunning card Faye, love the super cute image and the design & details are so pretty. I was just gonna say 'doily, but wot no lace?' when I saw the lacy pattern at the top of your paper. Beautiful card, you do layers so well, so I have no idea why you don't use them more often.